Back in the Frankfurt Motor Show history somewhere in 1999, Smart took all the attention by unveiling the ForTwo Cabriolet. The company didn’t stop and is back with its all new Smart Fortwo Cabrio 2016 at the Frankfurt Motor Show 2015. 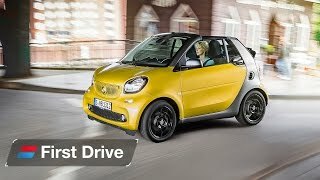 The third generation most affordable convertible gets some new inclusions so let us not delay and have a quick look at the descriptive review of Smart Fortwo Cabrio 2016 to know more. The interior of Smart Fortwo Cabrio 2016 is identical to what we saw in the recent coupe as far as dashboard and door panels are concerned. The same essence of coupe further spreads its wings to the dual-tone dashboard and large center console. Talking about the newly included design elements, the model is housed with a new infotainment system and an instrument cluster. The latter is housed behind the three-spoke steering wheel which surprisingly comes with an option of getting equipped with radio and navigation controls. Also new for the model are the spherical air vents over the dashboard which also can be ordered in many color options, giving you the entire freedom to get your car personalized. 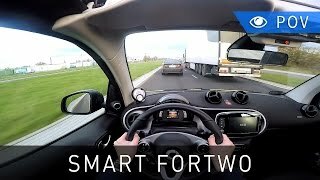 In all I found the interior of Smart Fortwo Cabrio 2016 catchy, spacious (especially with roof down) and tech oriented with lot of customizing options. The exterior of Smart Fortwo Cabrio 2016 gets commendable redesign for the year 2015. Starting with the front fascia it has a larger grille sitting proudly amidst the rhombic shaped headlights. Taking a look at the most important element, the roof; upon retracting the roof the B-Pillars get a bit narrower. Another interesting integration is the feature to semi-retract the roof and keeps it as a sunroof for a different experience. Moving towards the rear portion of the model, taillights get a squared-shape and come integrated with the reverse light and turn signals. The lower sitting roof takes around 12 seconds to completely retract and is adorned with a bit larger cloth. 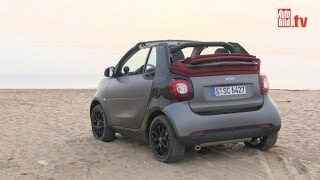 In all rounding up the entire exterior details of Smart Fortwo Cabrio 2016 I would say it’s a thorough overhaul to replace the predecessor and to compete with the growing automotive market. Beneath the hood of Smart Fortwo Cabrio 2016 are two engine options and both are three-cylinder. The first one displaces 0 liter and cranks total output of 71 hp and peak torque of 91 nm while the second displaces .9 liter and generates total output of 90 hp and peak torque of 135 nm. Both the engines can be coupled to either a five speed manual transmission or a fully automatic dual-clutch transmission. 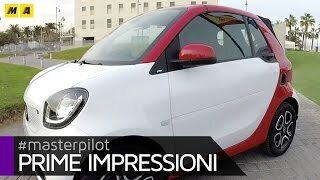 Talking about the top speed of Smart Fortwo Cabrio 2016, it can reach to 151 mph with former engine mounted and can hit 155 mph with later while the 0-62 mph sprint can be knocked in 14.9 (15.5) seconds and 10.8 (11.7) seconds respectively.